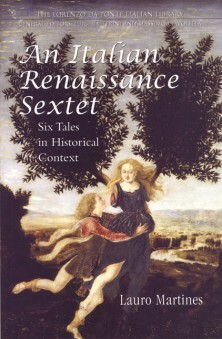 An Italian Renaissance Sextet is a collection of six tales offering a unique view of the history of Renaissance Italy, with fiction and fictional modes becoming gateways to a real, historical world. All written between 1400 and 1500 - among them a rare gem by Lorenzo the Magnificent and a famous account featuring Filippo Brunelleschi - the stories are presented here in lively translations. As engrossing, fresh, and high-spirited as those in Boccaccio's Decameron, the tales deal with marriage, deception, rural manners, gender relations, social ambitions, adultery, homosexuality, and the demands of individual identity. Each is accompanied by an essay, in which Lauro Martines situates the story in its temporal context, transforming it into an outright historical document. The stories and essays focus mainly on people from the ordinary and middling ranks of society, as they go about their ordinary lives, under the pressure of a highly practical, conformist, pleasure-loving (but often cruel) urban society. Revealing the concerns of a searching historical work with a combined anthropological, demographic, and cultural slant, An Italian Renaissance Sextet shines a probing light on Italian Renaissance culture.